Find out about Sussex’s income and expenditure – where income comes from and how we spend it. This information is based on the 2016-17 financial year. You can also read the latest Financial Statements 2017-18 [PDF 2.58MB] online. Your tuition fees contribute towards the running of your school, such as course materials and laboratory equipment; academic services such as IT and Library facilities; and the ongoing upkeep and repair of our academic buildings and estate. Tuition fees add up to about half of our total income and are one of a variety of income sources that we receive. 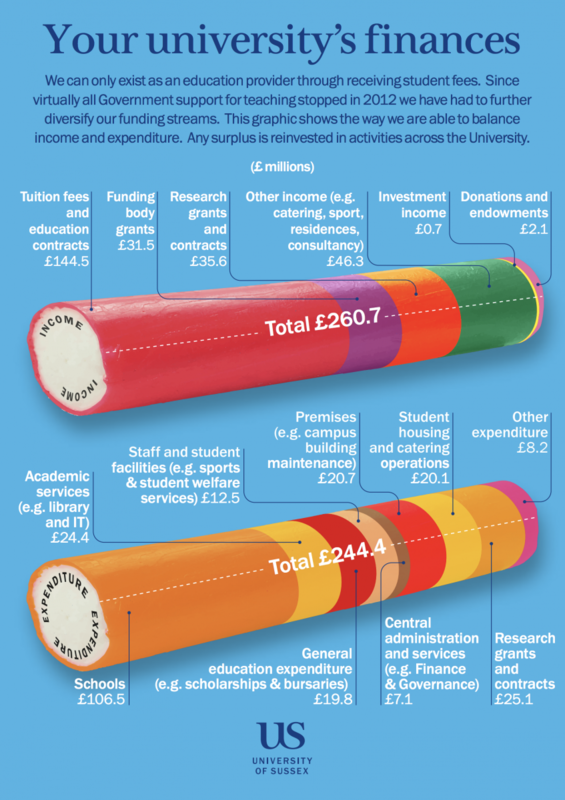 The total income is used to fund a broad range of expenditure – such as the Library and Sport services – that keeps the University running. The following chart shows our expenditure by category. You can also view this expenditure chart as a PDF [5.36MB]. Updated information for the latest financial year will be available on this page in the coming weeks. We can only exist as an education provider through receiving student fees. Since virtually all Government support for teaching stopped in 2012 we have had to further diversify our funding streams. The tables below show the way we are able to balance income and expenditure. Any surplus is reinvested in activities across the University.